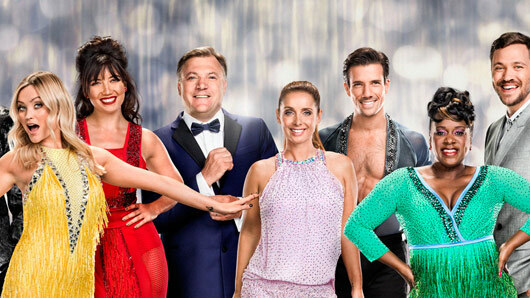 The song and dance list for this weekend’s Strictly Come Dancing has been confirmed! After the shock exit of Melvin Odoom from the show last week, 14 couples are now left remaining in the competition. This week, the celebrity and professional pairs will be dancing for survival to tunes from the big screen, as Strictly tries its first themed episode: Movie Week. There will be a number of different songs ranging across periods, from Singin’ In The Rain to Twilight, and no doubt we can expect some brilliant, movie-inspired costumes this week. Anastacia and Brendan will be dancing the Viennese Waltz to “A Thousand Years” by Christina Perri from the Twilight Saga. Claudia and AJ will be dancing the Charleston to “You Give a Little Love” by Paul Williams from Bugsy Malone. Daisy and Aljaz will be dancing the Viennese Waltz to “Spoonful of Sugar” from Mary Poppins. Danny and Oti will be dancing the Paso Doble to “The Train” by James Horner / ‘El Sombero Blanco’ from The Mask of Zorro. Ed and Katya will be dancing the Jive to “Great Balls of Fire” by Jerry Lee Lewis from Great Balls of Fire. Greg and Natalie will be dancing the American Smooth to “Everything I Do (I Do It For You)” by Bryan Adams from Robin Hood: Prince of Thieves. Judge Rinder and Oksana will be dancing the Charleston to “Meet The Flintstones” from The Flintstones. Laura and Giovanni will be dancing the Salsa to “Rhythm of the Night” by Valeria from Moulin Rouge. Lesley and Anton will be dancing the Quickstep to “A Couple of Swells” by Judy Garland and Fred Astaire from Easter Parade’. Louise and Kevin will be dancing the Cha Cha to “Flashdance… What A Feeling” by Irene Cara from Flashdance. Naga and Pasha will be dancing the Tango to “Theme from Mission Impossible” by Lalo Schifrin from Mission Impossible. Ore and Joanne will be dancing the American Smooth to “Singin’ In the Rain” by Gene Kelly from Singin’ In The Rain. Tameka and Gorka will be dancing the Tango to “The Heat Is On” by Glen Frey from Beverly Hills Cop. Will and Karen will be dancing the Salsa to “Jai Ho (You Are My Destiny)” by A.R. Rahman and the Pussycat Dolls from Slumdog Millionaire. Quite a line-up, eh? And not only that, but the show is also set to open with a special tribute to Rogers and Hammerstein, as the dancing couples celebrate the golden age of musical movies with their group routine.